Hundreds of posters of a smiling Russian President Vladimir Putin were put up in Cairo ahead of the two-day visit of the Russian leader to Egypt. The two countries have much on the table, from regional security to a free trade deal. Putin is visiting the Arab nation for the first time in almost a decade, although he’s already met Egypt’s new President Abdel Fattah el-Sisi twice since the military took power from the Muslim Brotherhood leader Mohamed Morsi in 2013 and was elected as Egypt’s new head in 2014. Economic ties are expected to dominate Putin’s trip. He heads a delegation of minister-level officials dealing with trade, agriculture, energy, investment and nuclear power. 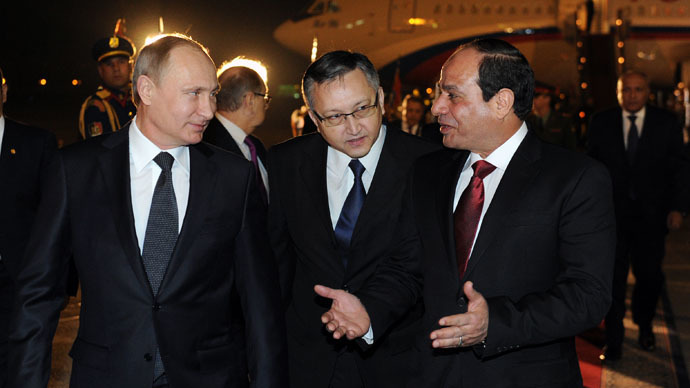 Last year saw a rebound of trade between Russia and Egypt from a sharp drop in 2013 and reached over $4.6 billion. To push the progress further, the two countries are to discuss a free trade agreement between Egypt and the Russia-led Eurasian free trade union, which also includes Belarus, Kazakhstan, Kyrgyzstan and Armenia. Russia and Egypt may also dump the US dollar and switch bilateral trade to their national currencies, Putin said in an interview with the Egyptian daily newspaper Al-Ahram ahead of the visit. Egypt also wants to boost profits from Russian tourists. The country’s tourist sector suffered greatly due to a downgrade in security in the wake of the ouster of President Hosni Mubarak in 2011 and is currently struggling to win back foreign visitors. Providing security remains a challenge for Sisi’s government, with militants regularly launching attacks on army forces in the Sinai Peninsula and bombings reported in large cities. Supporters of the Muslim Brotherhood, which saw resurgence under Morsi’s rule, but was again banned as a terrorist organization under Sisi, continue to pose a threat to government forces. The situation is aggravated by the quarrel between Cairo and its long-time supporter Washington. The US backed Mubarak’s ouster and the emergence of the Muslim Brotherhood as a major political power in Egypt, but lashed out at the military coup by Sisi and his allies. Following that, Washington froze its annual $1.5 billion aid to Egypt and put on hold a deal to supply Apache helicopter gunships that the Egyptian Army needed to fight jihadists in the Sinai. With Washington frowning, Moscow stepped in and offered a big $3.5 billion arms deal to the new Egyptian government. The deal was reached in September last year. The US has since resumed aid and unfrozen the helicopter deliveries, but its relations with Egypt are far from shiny, with the administration criticizing Sisi’s government for harsh tactics in cracking down on the Brotherhood. Putin’s visit gives a chance to both countries to send a message to US, demonstrating that they don’t need to follow its guidelines in foreign policy. Cairo states that in can find support from players other than America to deal with its domestic troubles. For Moscow, it’s yet another testament that Washington’s narrative of Russia being internationally isolated is mere wishful thinking. Another potentially big deal on the table in Cairo is the construction of Egypt’s first nuclear power plant. Russia is bidding for the project. On international matters, Putin and Sisi are expected to discuss threats to regional stability in the Middle East and North Africa, including the terrorist organization Islamic State (also known as ISIS, or ISIL), the poor state of post-Gaddafi Libya and the stewing Israeli-Palestinian conflict.